GERMAN ANTI-FASCISTS USE TOTALITARIAN MEANS AND WALL IN FELLOW TOTALITARIAN…….. – The Tundra Tabloids……. 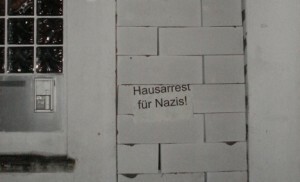 GERMAN ANTI-FASCISTS USE TOTALITARIAN MEANS AND WALL IN FELLOW TOTALITARIAN……..
Anti-fascists in Lower Saxony bricked up the front door of a top member of the extreme-right National Democratic Party’s (NPD) home to protest against his presence at a city council meeting on Monday. The front door was neatly walled in overnight, and sealed with a poster reading, “House arrest for Nazis.” An antifascist spokeswoman said the action was a symbolic attempt to stop him leaving the house. Police were called to the house in Oldenburg where Ulrich Eigenfeld, treasurer of the NPD, lives, after other people living there opened the front door and found their exit blocked. “The line is crossed for us when they leave the house with their misanthropic thinking,” said a spokeswoman for the group in an email, according to the Oldenburger Lokalteil website. She said that although anti-fascists were against walls in society, naming nationalism, racism, sexism and the class system as examples, this was a different case. “We say – tear down walls! But for Nazis we make an exception,” she said. Previous Post Previous Post STRENGTHENING ELISABETH’S VOICE……. Next Post Next Post ROBERT SPENCER INTERVIEWED BY MICHAEL COREN……..
Totalitarianism is a political system, not act act of protest. If you believe walling someone in is extreme then you don’t know what Gert Wilders has in mind for Muslims should he gain enough power in The Netherlands (and I voted for him). Sure, most of the politically correct Left are useful idiots when it comes to Islam. But there is an awkward appearance of fascism being defended here just because people against it decided to protest by walling up a door. You make “anti-fascist” sound worse than “fascism”. A weird position to defend. Smearing Geert Wilders is both simplistic and disingenuous. His party is clear on their politics, which does not mirror your “fears”. As for anti-fascists and the socialist cousins the fascists, they both are statist ideologies and both are to be opposed. I would not want either to run the society I live in.